Their Holinesses Pujyasri Jayendra Saraswathi Shankaracharya Swamiji and Pujyasri Sankara Vijayendra Saraswathi Shankaracharya Swamiji performed the Viswaroopa Yatra this evening. 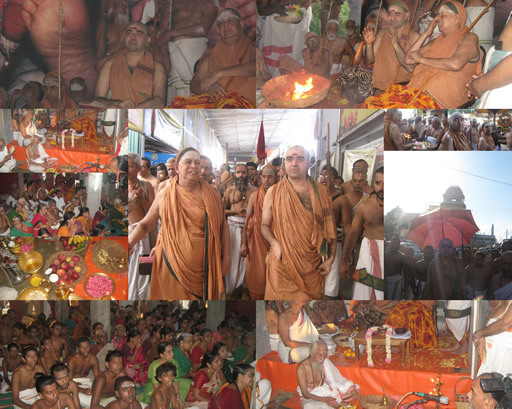 The Viswaroopa Yatra is performed on the Bhadrapada Poornima day (on 23 September 2010 this year), signifying the conclusion of the Chaturmasya Vratam beginning with the Vyasa Pooja on the Ashada Poornima day on the 25th July 2010. A large gathering of the devotees had assembled at Srimatam to take part in this unique function. At around 4-30 PM , both the Acharyas gave darshan at the hall opposite the Brindavan of the Mahaswami. A book on the prabhava of Sri Mata, as Durga, was released by the Holinesses and there after, both the Acharyas proceeded to the Sannidhi of Sri Chandramouleeshvara and Sri Maha Tripurasundari in Srimatam. Yatra danam was performed here, after which, Their Holinesses proceeded on the Vishvaroopa Yatra. At the main entrance of the Srimatam, Sri Adi SankaraBhagavadpada’s Utsava Vigraham brought from the Sri Kamakshi Amman temple in a procession, was worshipped by their Holinesses and the assembled gathering. sculptures of Lord Shiva, Dakshinamoorthi, Oordhvathandava Murthi etc., and of Durga sculpted on the vimanas of its Garbhagruha, to the devotees who were accompanying Him in processsion. Traditional poornakumbham was offered to His Holiness at the temple. After crossing the railway line, the> procession entered the new and upcoming township under formation. A convenient Mandapam under construction was chosen as the venue for assembling of the members of the procession. Both Holinesses and the Sannyasis who accompanied the procession were seated in a small platform here. and performed Sri Krishna Pooja. After this, he started reading the traditional XI Chapter of Srimad Bhagavad Gita, that is being read customarily on these occasions. He read this in a slow gait, padam after padam (Padam- quarter), so that all in the assembly could repeat the verses conveniently. Prasadam to every one. With the Vishvaroopa Yatra over thus, both Holinesses returned to the Mutt.